This award was established in 1974 by the friends of Donald S. Kingery. From 1975 to 1986, the award was conferred by the Donald S. Kingery Memorial, Inc. Beginning in l987, the PCMIA assumed sponsorship of this award program. The Pittsburgh Coal Mining Institute of America (PCMIA) annually recognizes an individual who has significantly contributed to the furtherance and improvement of mine safety and health. Nominations may be made for persons involved in any type of mining and are not limited to the coal industry where Mr. Kingery made his principal contributions. 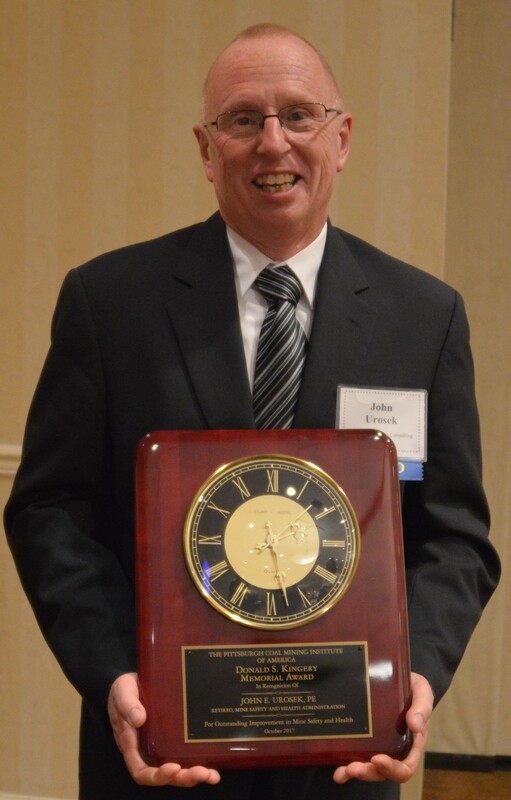 The award consists of an inscribed commemorative clock that is presented at the annual luncheon of the PCMIA which is normally held in late October. The nomination write-up for this award is limited to the following constraints. The write-up must be submitted on 8.5 x 11 inch paper size, margins shall all be 1-inch, spacing shall be single or double-spaced, the font used shall be Times New Roman, 12 point, and the total number of pages shall be no more than 6 single-sided pages (excluding the cover sheet). The cover sheet shall include only the following: Name of Nominee, Current Position or Title, Business Address, Home Address, Email Address, Office Telephone Number, Name or Person Submitting Nomination, Address, Email Address, Office Telephone Number, and date the nomination was submitted. The write-up for the award nomination shall consist of two sections as follows. The selection of a successful recipient is based on the candidate’s overall career impact on mine safety and/or health. Nominations will be accepted from individuals, companies, organizations, universities, or associations. The award application must be submitted by someone who knows the nominee well; self-nominations will not be accepted. This section of the nomination is limited to no more than three pages. This section should include contributions, results achieved, and in-depth discussion of the nominee’s overall commitment to mine safety and health. This section of the nomination is limited to no more than three pages. This section should include a biographical sketch of the nominee and should contain information relative to the nominee’s background, affiliation with the mining industry, and those significant contributions warranting consideration. The scope and impact of those contributions should be described. Upon review of all active submissions for the award, the PCMIA Awards Committee will recommend a nominee to the PCMIA Board of Directors for approval. Upon approval, the successful nominee will be notified by early October. The award is presented at the annual luncheon of the PCMIA which is normally held in late October of each year.It is tradition that the recipient be scheduled as a featured speaker following the annual PCMIA luncheon. The Pittsburgh Coal Mining Institute of America (PCMIA) annually recognizes an individual who has significantly contributed to the furtherance and improvement of mine safety and health. Nominations may be made for persons involved in any type of mining and are not limited to the coal industry where Mr. Kingery made his principal contributions. The selection of the successful candidate is based on his/her overall impact on mine health and safety; judgement includes consideration of contributions, results achieved, and the nominee’s commitment to mine safety and health. John E. Urosek has a Bachelor of Science degree in Mining Engineering from The Pennsylvania State University and is a registered Professional Engineer. John is currently a mining industry Consultant operating as John Urosek Mine consulting, LLC since May 2017. He provides expertise in mine fires, mine explosions, mine emergencies, mine emergency preparedness, ventilation and mien gases. John was employed by the Mine Safety and Health Administration, United States and Health Administration, United States Department of Labor from 1974-2017. He served as a mining engineering who has worked in the areas of ventilation, fires, explosions, dust control, roof control, and enforcement activities. He worked as a mining engineer in the Ventilation Division since 1979. He was promoted to Supervisory Mining Engineer in 1985. From 1985 to 1995, he was the Chief of the Mine Ventilation Division. In 2002, he joined MSHA’s Mine Emergency Unit as man of the Emergency Temporary Standard on sealing of abandoned areas. In 2007, he was promoted to become the Chief of Mine Emergency Operations. In 2007 and 2008, he served as chairman of the final rule on sealing of abandoned areas. He served as a lead investigator in numerous mine disasters including the William Station Mine Explosion, the Blacksville Mine Explosion, the Sago Mine Explosion, and the JWR No. % Mine Explosion. John has been a member of the Connellsville Township Volunteer Fire Department since 1974 and during this time, he has responded to well over 200 structure fires. He has also been part of Emergency Management for Connellsville Township, PA since 1989. John Urosek’s commitment to improve miner safety has been exceptional. The PCMIA is proud to recognize him as the recipient of the 2017 Donald S. Kingery Memorial Award.